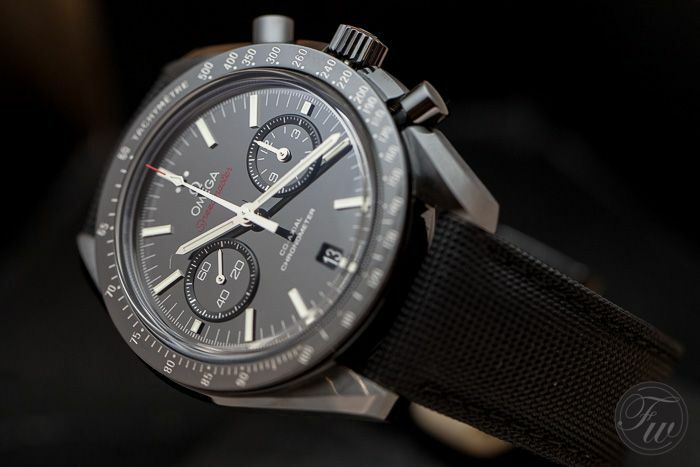 To our surprise, Jean Claude Monachon (Head of Product Development) of OMEGA showed us not only the new Speedmaster 9300 line-up (Dark Side of the Moon and ’57 editions) and Aqua Terra 15.000 Gauss, but also a new OMEGA Seamaster Bullhead. If you are following us on instagram, you probably have seen our quick snaps of these watches already. However, here are the pictures we took during the presentation with a decent camera. 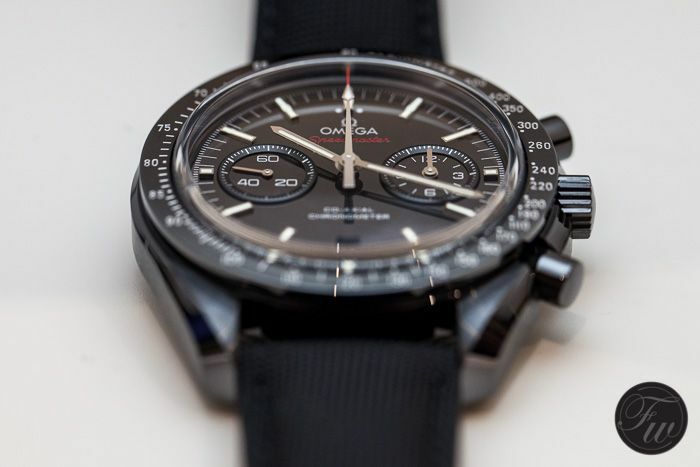 There was already some buzzin’ around just before Baselworld, perhaps OMEGA did that on purpose, perhaps not. 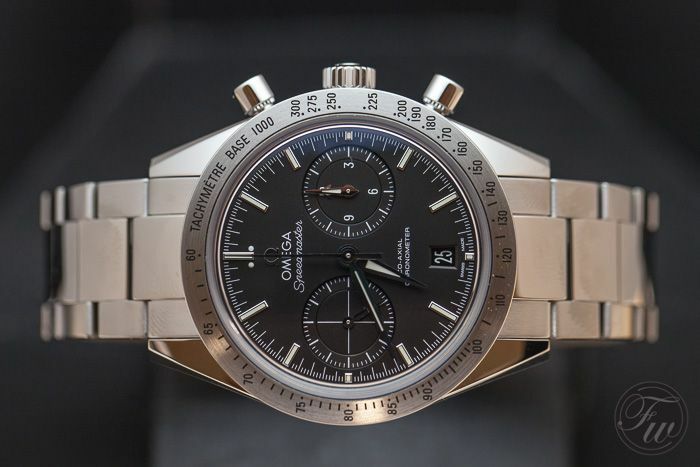 The new caliber 9300 Speedmaster Dark Side of the Moon is made out of one block of ceramics. 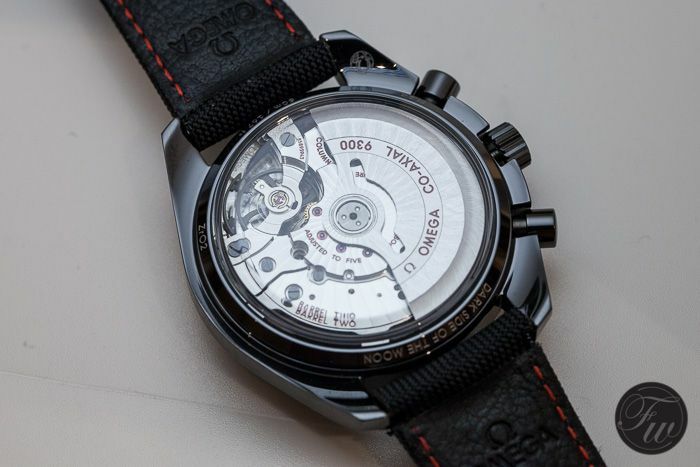 Actually, OMEGA considered the use of PVD and DLC techniques as well, but they didn’t accomplish it in such way, that it was up to their level of quality standards. In fact, Jean Claude Monachon has always been searching for a way to create a black Speedmaster since he joined OMEGA about 16 years ago. The use of ceramics was jack pot for them, after a special OMEGA task force was occupied by this project for quite a while. 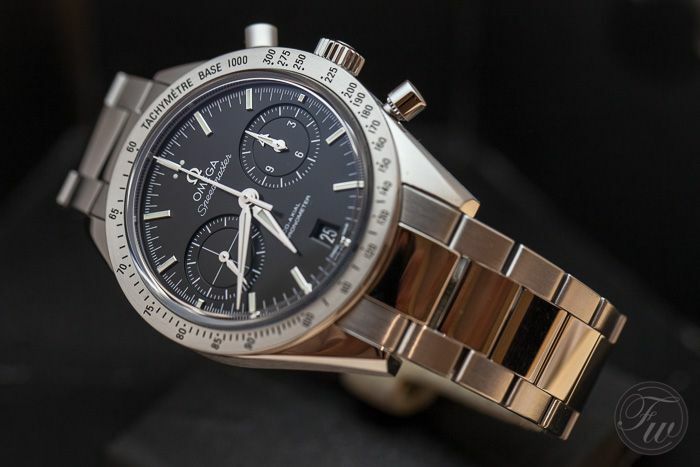 The Speedmaster 9300 Dark Side of the Moon not only has a case made out of ceramics, also the dial and buckle are made out of ceramics. 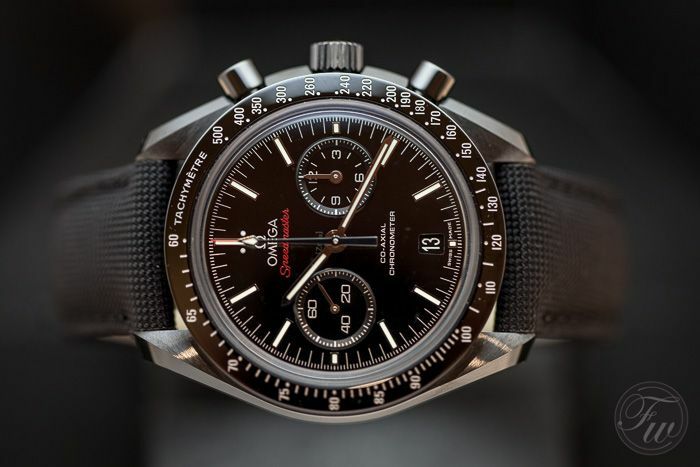 OMEGA told us that the price of the Dark Side of the Moon Speedmaster will be 10,000 Swiss Francs, excluding VAT (8% in Switzerland). 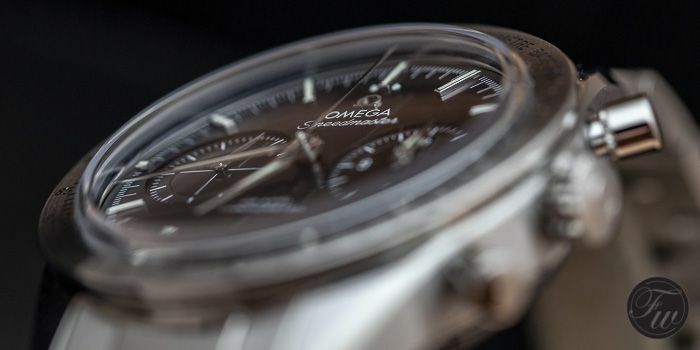 With the Speedmaster 9300 ’57 edition, OMEGA wanted to pay tribute to the original Speedmaster Broad Arrow model from 1957, the reference CK2915. This ’57 edition will become available in various versions; in stainless steel, titanium and in gold. The white dial version is the model that is being made out of titanium. This Ti model with leather strap will have a 8,900 Swiss Francs price tag (excluding VAT). Add 600 Swiss Francs for a titanium bracelet. The model we love best is the stainless steel ’57 edition, with straight lugs (so the diameter is a tad bit smaller) and a beautiful black/grey-ish dial. The bracelet is quite flat with a polished center link, inspired by those original Speedmaster bracelets from the 1950s (ref.7077) and 1960s (ref.1039). 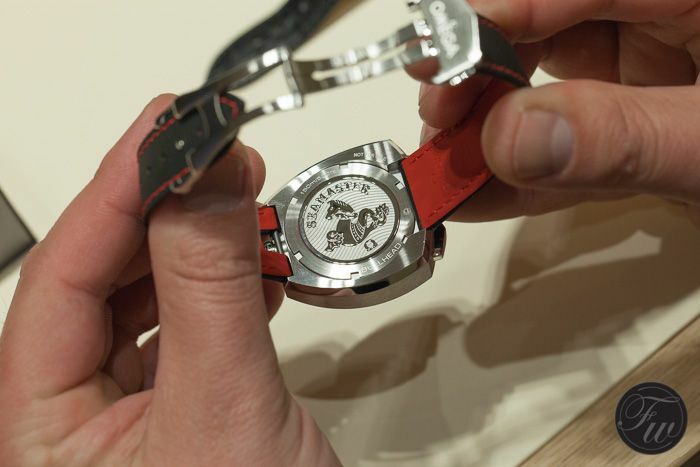 Price for the stainless steel ’57 edition is 7500 Swiss Francs, excluding VAT. 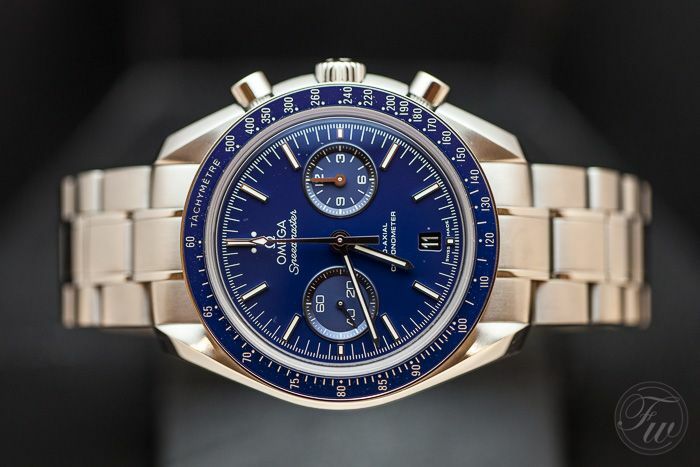 We are a huge fan of the Speedmaster 9300, as you can read here and here. 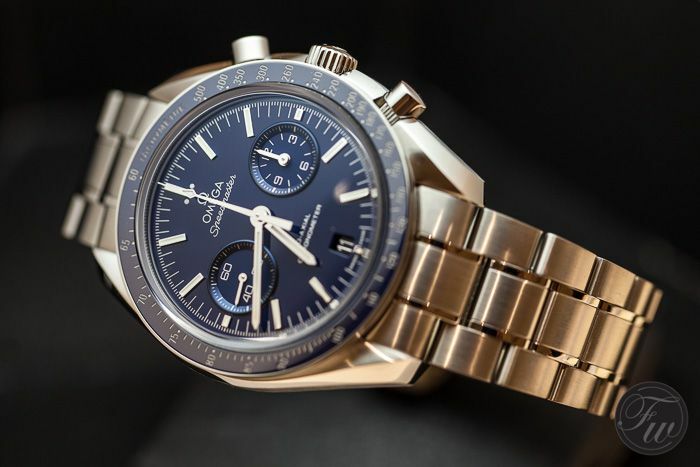 This year, OMEGA introduces this ‘standard’ Speedmaster 9300 in titanium with a blue dial and a blue ceramic bezel. Price will be 9,500 Swiss Francs excluding VAT. 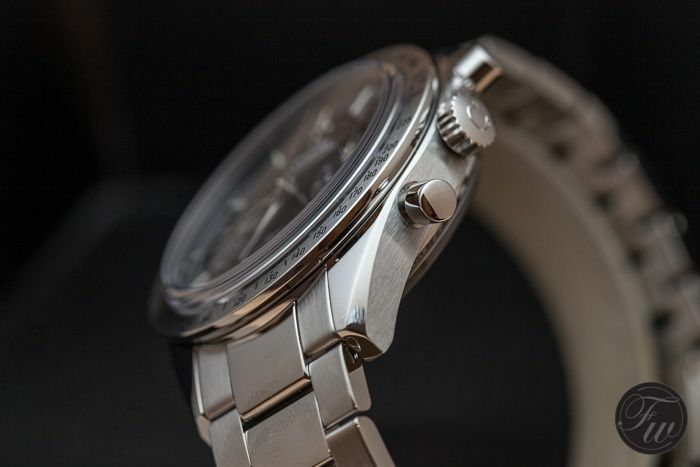 A nice surprise this year for us is the revival of the famous Seamaster Bullhead. The vintage 1970s Seamaster Bullhead is fetching crazy prices in the collector’s market, but there’s now also one in the current collection. This Seamaster Bullhead is a two-register chrono with the pushers at 12 o’clock. 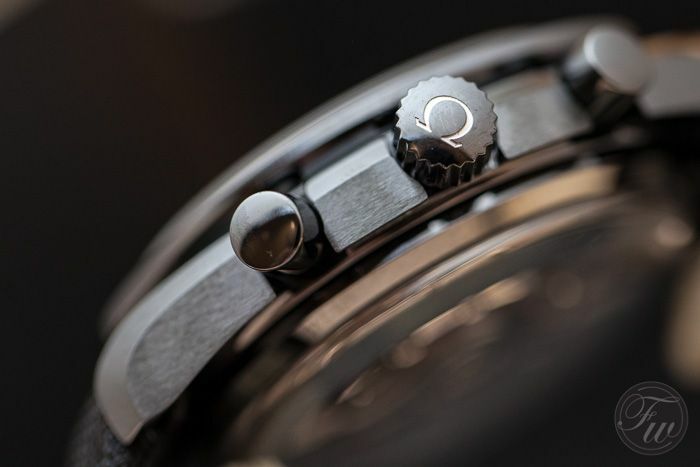 The crown – with OMEGA logo – always locks in the same position. Something that watch enthusiasts have been longing for. The Seamaster Bullhead will come in three versions: a black dial, a white dial and a silver dial. The movement has this 2 register chronograph feature, with 30 minutes counter. 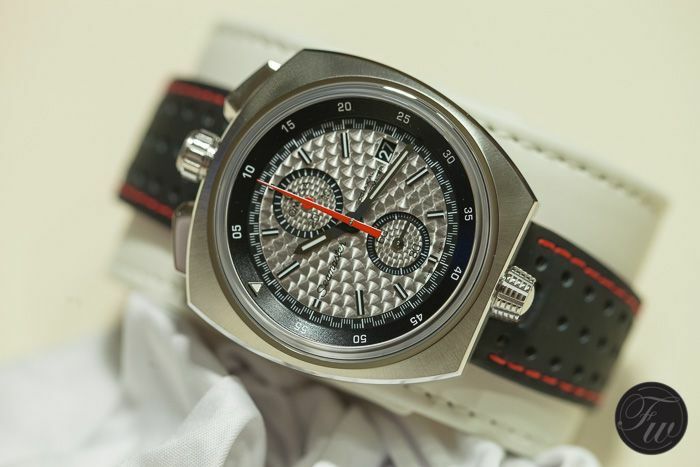 The price of the Seamaster Bullhead will be 8000 Swiss Francs (excluding VAT). And yes, there is more OMEGA news. We will follow up with it shortly. In the meanwhile, follow us on instagram (@fratellowatches) and Facebook.